BEMUS POINT, N.Y. Increasingly popular bathroom wipes -- pre-moistened towelettes that are often advertised as flushable -- are being blamed for creating clogs and backups in the nation's sewer systems. Wastewater authorities say wipes may go down the toilet, but even many labeled flushable aren't quickly breaking down. That's costing some municipalities millions of dollars to dispatch crews to unclog pipes and pumps and to replace and upgrade machinery. 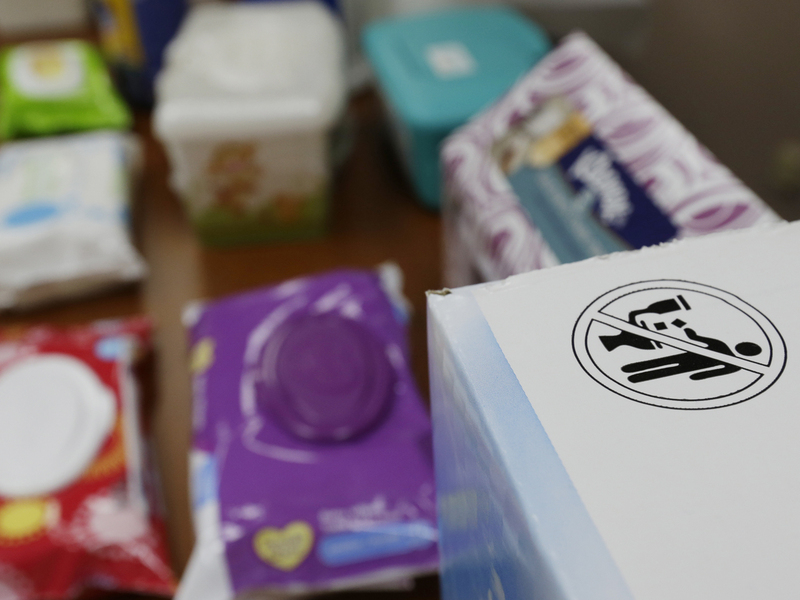 Manufacturers insist wipes labeled flushable aren't the problem, pointing instead to things like paper towels, feminine hygiene products and baby wipes clearly marked as non-flushable. The Association of the Nonwoven Fabrics Industry recently specified seven tests for manufacturers to use to determine which wipes to call flushable, and has come out with a universal stick-figure, do-not-flush symbol to put on packaging.